MSG The Messenger movie controversies, facts, records, messages, impact, music, success & much more. 1. Movie in news before release. The movie was everywhere even before its release: controversies, conspiracies & debates. (i) Movie came into news even before shooting was started. (ii) There were discussions everywhere about the Saint using the way of movies to convey social messages. (iii) Movie remain in news all the time because it was the first time when a Saint was coming in a movie. (iv) There were debates on news channels: Can a Saint make movie? Movie will be flop or hit? (v) After the announcement of release date, media showed that many Sikh people are opposing the release of this movie but was later proved to be a political conspiracy. (vi) INLD was openly against Saint Gurmeet as Dera Sacha Sauda didn't favor their party during elections. (vii) Censor Board banned MSG saying that they didn't understood the movie, whole country was in shock to hear such a stupid reason, everyone wanted this movie to be released, twitter trends like #iSupportMSG were at top for days. The matter was then sent to Film Certification Appellate Tribunal (FCAT) where the officials said that this movie is completely fine & gave green signal to this movie to be released on desired date i.e 16Jan. Later news came that Censor Board rejected that movie under pressure from big political leaders, some sources said that they were bribed to reject the movie for no reason. When these news went viral, Censor Board chief Leela Samson along with many other members decided to quit. (viii) According to FCAT movie is completely fine except two dialogues were to be muted & a "disclaimer" was to be shown for 1 minute at the starting & ending of the movie. (ix) The movie release date was postponed & premiere show was organized on 16th Jan 2015 at Leisure Valley Ground, Gurgaon. 1,57,231 fans were present at premiere show, but movie was not shown as some certificate was not in the director's hand at that time & Dr. Gurmeet decided not to start the show saying that certificate may be just a formality for us now still starting the show is against the law at this time. Saint didn't disappointed his fans so he made it a rock show or a promotion show for the movie, fans were happy & were dancing over MSG tunes. (x) The name of the movie was changed to "MSG The Messenger"
(xi) Movie was successfully released on 13th Feb 2015, however security was provided at many multiplexes first but it was removed soon. 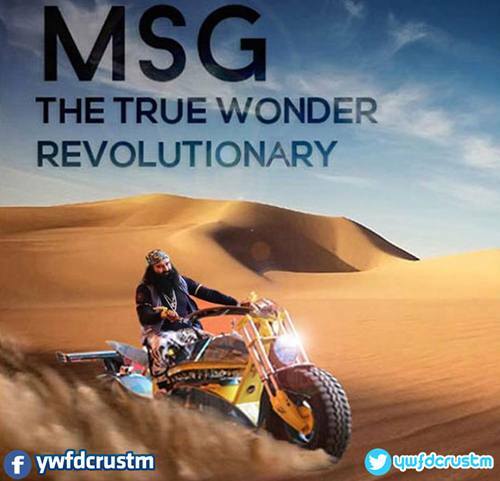 (i) Movie was said to be released with the name "MSG The True Wonder Revolutionary" but movie teaser came out with the new title "MSG The Mesenger Of God" which was later changed to "MSG The Messenger". (ii) Movie along with 7 songs was released in 5 different languages worldwide: Hindi, English, Tamil, Telugu & Malayalam. 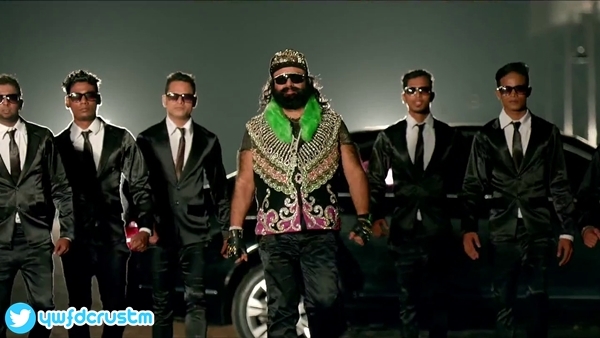 (iii) About 90% of the movie is shot in Dera Sacha Sauda, Sirsa, Haryana. (iv) Saint Dr. Gurmeet Ram Rahim donated all his profits for Thalassemia & Cancer patients. (v) Saint Dr. Gurmeet Ram Rahim Singh Ji Insan is not just in lead role, he is director, costume designer, choreographer, art director, action director, lyrics writer, music director, singer, DOP, story writer, screenplay & dialogues writer. (vi) All stunts in the movie were performed by Saint himself, no duplicate was used. (vii) This film was completed in a short span of 67 days, Saint proved to be a one take actor. (viii) The movie casts 13 Lakh real actors representing almost all major religions seems to be a record in itself and which has not been witnessed by cinema before. (ii) Saint Gurmeet Ram Rahim singh ji Insan chief Patron of Dera Sacha Sauda ,Sirsa,Haryana,India,designed most dresses(56) for the lead role played by himself in the movie ‘MSG – The Messenger’.Film was released,on February 13, 2015.Moreover film was mainly directed and developed by himself. (iii) Hakikat Entertainment Pvt. Ltd., Sirsa, Haryana, India ,produced film ‘MSG-The Messenger’, wherein most participants (1,31,517) were present in a particular scene.The film was starred and directed by Saint Gurmeet Ram Rahim singh ji Insan. Moreover film was mainly directed and developed by himself. Hakikat Entertainment Pvt. 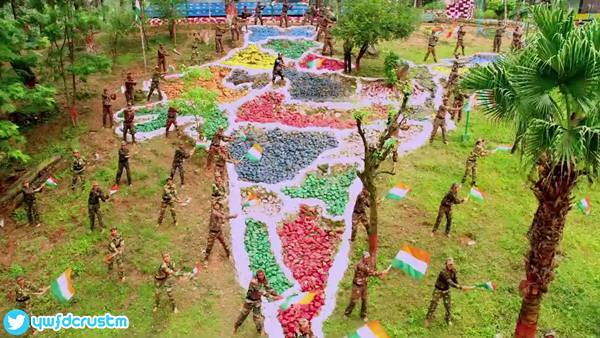 Ltd., Sirsa, Haryana, Produced film ‘MSG-The Messenger’, wherein 75,127 participants lighted candles together in a particular film scene. The Film was starred and directed by Saint Gurmeet Ram Rahim Singh Ji Insan. Hakikat Entertainment Pvt. Ltd., Sirsa, Haryana, produced film ‘MSG-The Messenger’, wherein 1,29,724 participants performed a dance sequence together in a particular film scene. The film was starred and directed by Saint Gurmeet Ram Rahim Singh Ji Insan who wrote songs, scripts & dialogue of the film and composed, sung and choreographed all songs. 4. Messages in the movie. Corruption and ever increasing Drug Abuse is focused in this movie, which aims at reviving humanitarian values and promoting social welfare work. There is a combat of truth with corruption and lies, and how truth prevails! (i) Movie tells us about the problems our society is facing: drug addiction, corruption, misuse of media, political support to drug mafia. (ii) Movie promotes social welfare works: tree plantation, blood donation, Food bank for poor & disabled, cleanliness campaigns. (iii) Movie also focuses on rights of Third Gender aka Sukhdua Samaj [name given by Saint]. (iv) Subhdevi: Movie also tells us how prostitutes are adopted by Dera followers and also how their marriage take place in Dera. (v) Gulstick: A game invented by Saint to keep our sanskriti alive, its a modified version of our ancient game gulli-danda. (vi) There are many other messages too: God reside in all of us, disabled can also contribute to society, helping roadside victims, third gender can donate blood, clothes doesn't define you, power of prayer, importance of self defense, never accuse without proof, suicide is wrong, spread love & many more. Music was launched under the label of Sony Music Company, movie has 7 songs: Never- Ever, Ram-Ram, Ratta- Batta, Daru ko Goli Maro, Desh Ke Liye, Papa The Great and the Remix version of Never Ever. The music of the movie is just superb and will generally entice youth. Already there is over a dozen of His music Albums in languages ranging from Hindi to English, Punjabi to Rajasthani, with all kinds of music, varying from Pop to Jazz to Folk to Rock which has already made its place amongst the youth. These songs can commonly be heard as Mobile Tones of many. Even Wedding Receptions are not left untouched of His songs, which can be seen playing at these too. 6. Success of the movie. (i) Till the end of the 7th weekend (5th April 2015), the total collection of the movie was Rs. 162 Crores. There were housefull shows till 10th week in North India, collection can be estimated around 170cr(+). (ii) The real success of the movie is the change that this movie is making in the society: thousand of people quit drugs & many other bad habits just by watching this movie, youth is enjoying songs like Daaru Ko Goli Maaro instead of songs which promote alcoholism, kids are dancing over tunes of Ram Ram, that's a huge change for sure. (iii) Movie created storm across the social media platforms like Youtube, Facebook, Twitter, Whatsapp etc. (iv) Six world records is a record itself. 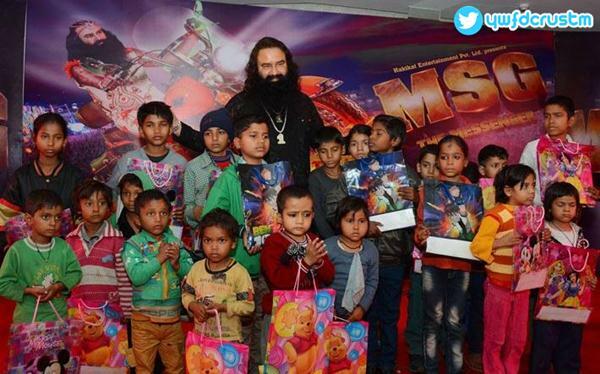 We hope after MSG2, in future, we will see many more of the MSG series!